Elizabeth Pacheco in front of her altar at the Día de los Muertos festival at La Villita in San Antonio. People gather in the alleyway of La Villita Historic Arts Villiage for the Día de los Muertos festival. Altar commemorating the 10 undocumented immigrants -- who were found dead in the back of a trailer-truck in a San Antonio Wal-Mart parking lot last summer -- at the Día de los Muertos festival at La Villita in San Antonio. Some Hispanics of Mexican descent have never heard of Día de los Muertos — or they simply never cared about it when they were children. But as adults, some have developed a new appreciation for this ancient holiday. 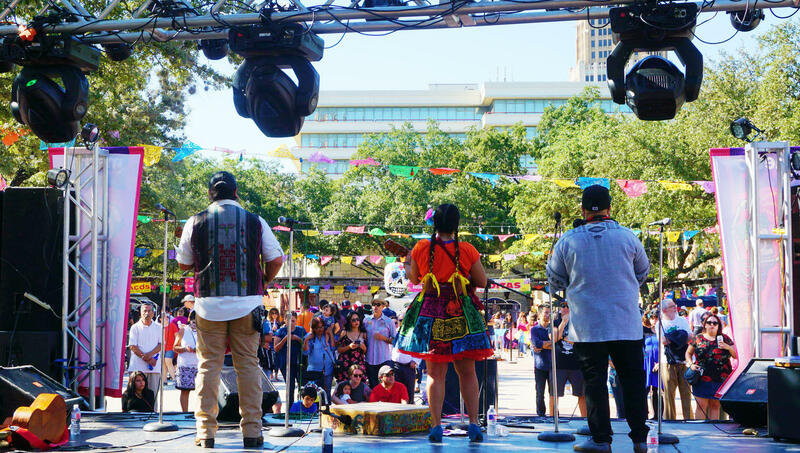 And the perfect place to make those connections is a Día de los Muertos festival in downtown San Antonio. 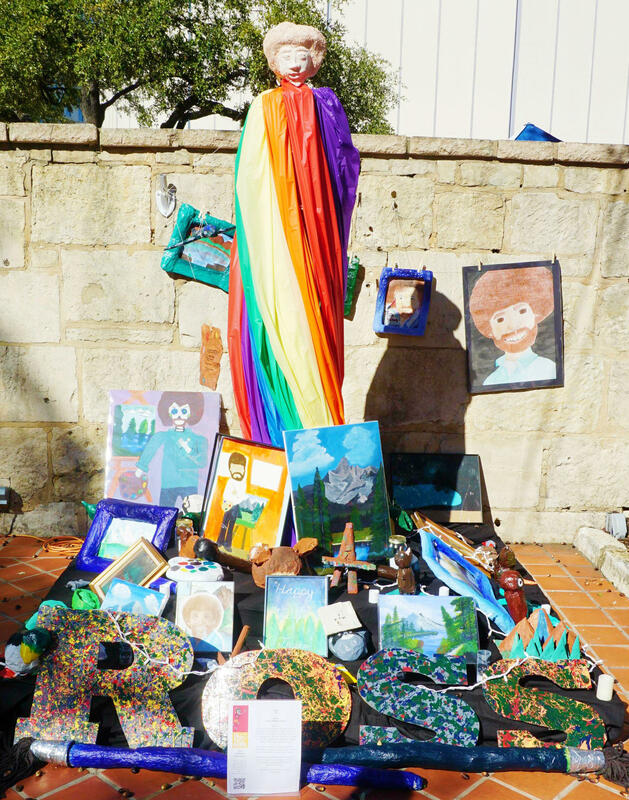 An altar honoring Bob Ross at the Día de los Muertos festival at La Villita in San Antonio. Music spills out onto the streets, and crowds swell in the alleyways of La Villita Historic Arts Village on San Antonio’s River Walk. Among the original artwork and fresh agua frescas is the largest open-altar exhibition in San Antonio. Altars at the festival honor celebrities like painter Bob Ross and even famous animals like Koko, the gorilla that communicated with caretakers through sign language. One altar even pays homage to the 10 undocumented immigrants who were found dead in the back of a trailer-truck in a San Antonio Walmart parking lot last summer. But the most familiar altars are the ones that honor ancestors. Irma Jimenez has designed and built altars for 20 years. She said many Hispanics have never grown up with the tradition. Irma Jimenez holding a photo of her first altar assembled 20 years ago. 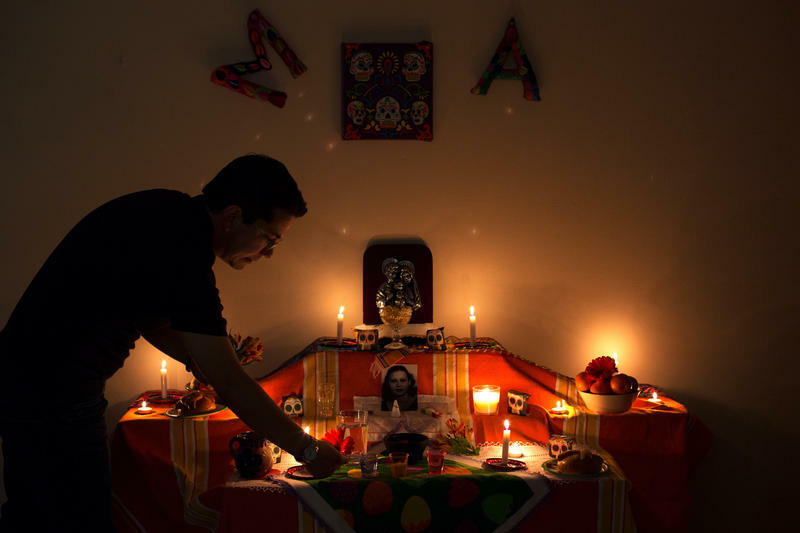 "They’ve never seen 'un altar de los muertos,' " Jimenez said. "They’ve never seen an 'ofrenda.' And now they’re learning this, and they all want to make one at home." The altars, also referred to as “ofrendas,” are an essential part of the Día de los Muertos celebration. Items that are most often placed on an altar include photos of deceased loved ones, candles to guide the spirits on their way back to the land of the living, and even food to share with their dearly departed. The altar honored various ancestors and even her beloved bulldog. She said the dog is now fighting off evil spirits while the portal to the land of the dead remains open. A mural featuring the names of deceased loved ones at the Día de los Muertos festival in San Antonio. Pacheco, whose face was painted to resemble an elaborate sugar skull, said she embraces the holiday from more of a cultural standpoint than a religious one. Maxwell Jimenez enjoyed the festival in Maverick Plaza with his wife and daughter. He said it reminded him of how he celebrated as a child in Mexico. El Tallercito de Son perform to a crowd gathered in Maverick Plaza during the Día de los Muertos festival at La Villita in San Antonio. 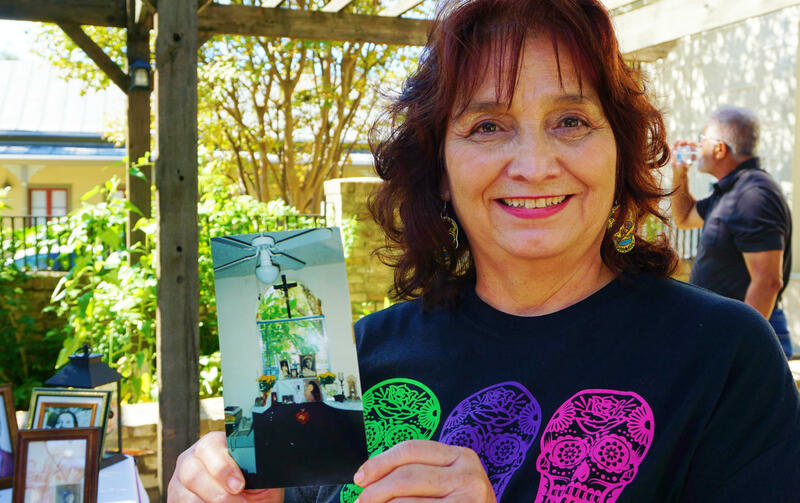 Once we look past the calavera T-shirts and koozies, Irma Jimenez said the tradition remains centered on the inevitability — but not finality — of death. Día De Los Muertos – also known as the "Day of the Dead" – is actually a multi-day tradition starting on Halloween, Oct. 31 and ending on All Soul's Day, Nov 2. RENEE VICTOR: (As Abuelita) No music. UNIDENTIFIED ACTORS: (As characters, singing in Spanish). Decorative sugar skulls line the front of the colorful, four-tiered altar. Cempasúchiles in bloom are scattered between painted skeletons, unlit candles and plates of food resting on pink papel picado, an intricately designed tissue paper. Three banners hang above the display. In the center, La Catrina, the female skeletal figure that has become an icon for the occasion, is painted with a declaration: Día De Muertos. Day of the Dead.